Alan was 3 x award winner in the David Shepherd Wildlife Artist of the Year 2018 and BBC Wildlife Artist of the Year 2010. 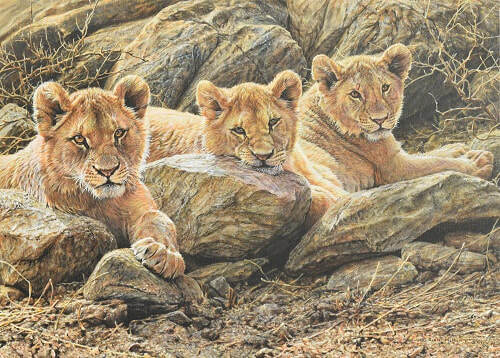 Alan M Hunt's work featured at this year's David Shepherd wildlife artist of the year 2018 competition and exhibition where he won 3 awards. 50% of all sales at the wildlife artist of the year exhibition went to supporting and fighting wildlife crime, protecting endangered species and engaging local communities in Africa and Asia. Category Winner in the Animal Behaviour Category also The Artist Magazine Award was selected independently by the editor of The Artist Magazine, Dr Sally Bulgin - and the prize is a feature article for the successful wildlife artist in "The Artist magazine". Dr Bulgin said she chose Alan Hunt as her winner, not just because of the extraordinary detail in this work, but for the high standard of all of Alan’s entries in this years wildlife artist of the year competition. "Most of Alan Hunt's painting is black, white and grey and yet a touch of orange and some great painting makes this as an absolutely stand-out painting." PEOPLE CHOICE WINNER - Alan additionaly won the coveted "People's Choice Award" independently selected by visitors to the exhibition. Another popular theme revolves around the idea of movement, of wildlife in action, muscles caught forever in the moment. This Way Son by Alan Hunt emerged as a big winner for the incredibly immersive capture of three zebras straining to cross a fast-flowing river, their gasping breaths amid the thundering of the water almost radiating from the frame. Alan is a semi-retired retired animal artist and was previously the a section winner in the BBC Wildlife Artist of the Year 2010 with his exquisite tiger painting titled "The Watchmen" in the animals in their environment section / category and overall runner up with his painting "Tiger in Water" aka "Riverside Ambush" at the BBC wildlife artist of the year competition in 2010. 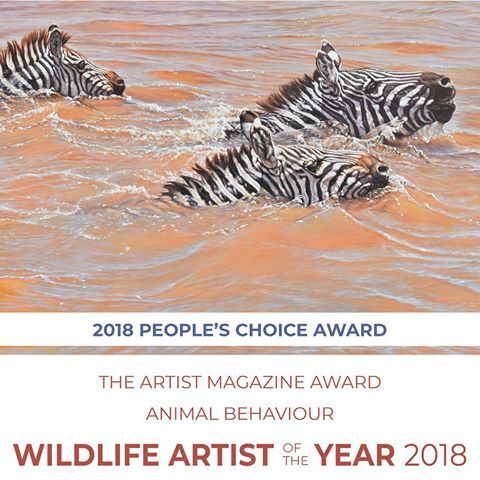 ​As above he recently won 3 awards at the David Shepherd Wildlife Artist of the Year 2018. These have been the only two art competition he has entered in the last 10 years. See these winning wildlife paintings below. Category: Animals in their Environment: Winner: Alan M Hunt. What the artist said: "As a wildlife artist, I owe a great debt to the subjects I paint. This is especially true of the big cats. So when I was invited to Ranthamboure in India to study it's tigers and be part of a major conservation project, I jumped at the chance. This painting was inspired by the National Park and the love of the cats that I saw on this trip." 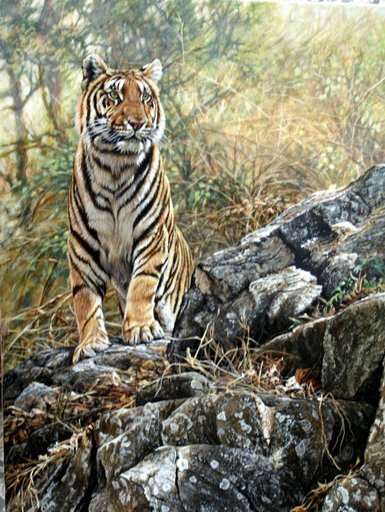 Alan's mmeticulously painted study of a tiger on a rocky outcrop beautifully conveys its forest habitat: you can almst hear the crackle of dry leaves under your feet"
THE SOCIETY OF ANIMAL ARTISTS (USA) Award of Excellence on four occasions and The Wildlife Art Society’s UK Best Artist on Show for three consecutive years. 1999 Artist of the Year, Florida Wildlife Art Festival, First Englishman to be Inducted into the American Wildlife Hall of Fame. 1997 Washington State Wildlife Art festival, Artist of the Year, 1993 Minnesota Wildlife Artist of the Year at Wildlife art festival, 1990 - Pacific Rim won International artist of the Year, 1989 - Pacific Rim wildlife Artist of the Year. Won 1st of 3 Gold medals from US Society of Wildlife Artists.